The new and improved Pyramid Receiver PR-SL-R-TI is the newest addition to Prosthetic Design's Pyramid line. It offers sliding and 360 degrees of rotation with a low profile of only 30.5mm. This component is manufactured of titanium and is compatible with the European 4-hole pattern. The rotation is locked into place by tightening the four adjustment set screws on the receiver. The rotation is positively controlled in three-degree increments with the use of interfacing radial serrations. The slide function is locked at the same time the four adjustment set screws of the receiver are tightened. With clearances less than two inches, MICA Corp.'s Genesis Low Pro Foot and Ankle System provides the only multiaxial prosthetic foot suitable for long BK and Symes-level amputees. The Genesis Low Pro combines the Genesis System multiaxial technologies with advanced-strength carbons and composites to create a system of optimum comfort and durability. This system offers the most natural range of motion at a minimal height. Comes with foot shell andSpectra sock. Free lifetime replacement of bumpers. Comes with threaded male adapter. Suitable for all activity levels. The Aura is a sock with a specially designed seal to work with expulsion or vacuum systems, which allows the prosthetist to select the height of the seal. Used in combination with Evolution custom Silk liners, or Evolution Origin off-the-shelf liners, the Aura seals against the inner wall of both AK and BK sockets. Fillauer has created the smallest, lightest shuttle pin lock available. Weighing less than 2 oz. and only 1/4 in. thick, the Fillauer Wrist Lock is the perfect lock for upper-limb patients using locking liners. Its precision machining and durable all-metal construction ensure years of trouble-free operation. The positive locking plungers (pins) for this lock are available in 1 in. and 1.5 in. lengths for liners with 6mm and 10mm threads 1/4 x 20 5-10 in. 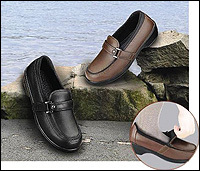 Orthofeet new fashionable low-heel shoes offer the "Slip-On" look with the comfort of adjustable-strap shoes. These unique Slip-Ons feature a wide opening for easy on/off along with a two-way strap system that enables fastening on either side of the shoe. This limited-time offer is available exclusively through SPS and is applicable on SPS purchase orders dated March 1-May 31, 2010, for any size or configuration. 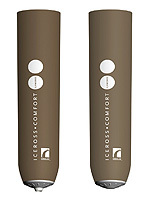 Comfort's Cushioning SenSil Gel Silicone provides protection to bony prominences and scarred sensitive areas. 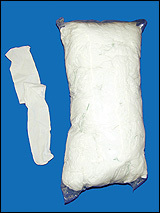 Comfort's Stabilizing Matrix and size-specific distal attachment makes it a good choice for low-activity users with fragile and exposed tissue. 14 sizes in either 3mm or 6mm profiles. Maintaining its focus on the needs of low-activity amputees, SPS is pleased to launch the new Flex-Foot® Balance prosthetic foot from Ossur®. Balance's design initiates with a carbon-fiber footplate with full-length toe lever that is lighter and 1-2cm longer than the K2 Sensation. At 490g (size 27cm foot with foot shell and standard male adapter), Balance is the lightest K2 multiaxial foot available on the market today. New removable foot cover has sandal toe. Applicable to users with no potential for walking at variable speed. Sizes 21-28cm in categories 0-3. Ultraflex toe pads are available for purchase individually or with Ultraflex customfabricated orthoses made in the Ultraflex Lab. 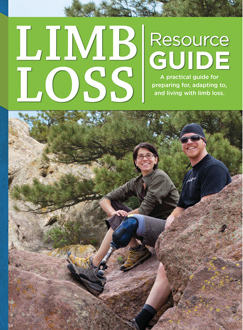 Ultraflex toe pads are an ideal addition for neurologically involved patients. They come in extra small (∆ ≤ 2 3/8 in. ), small(2 3/8 in. < ∆ ≤ 2 5/8 in. ), medium (2 5/8 in.< ∆ ≤ 2 15/16 in. ), and large (2 15/16 in.< ∆ ≤ 3 1/8 in.). Ultraflex toe pads are recom-mended for use with Ultraflex Adjustable Dynamic Response™ UltraSafeGait™ for managing gait deviations. SPS has immediate availability of the new Silhouette VS prosthetic foot, which provides shock absorption and multiaxial ground compliance to ease progression onto otherwise unforgiving surfaces. Vertical shock absorption softens impact at heel strike to provide comfort and preserve residual-limb health. Multiaxial function and +/- 15 degrees of inversion/eversion provide excellent ground compliance and stability. Optimized sole plate with tri-durometer urethane strips transfers load from lateral to medial plane with each step for more natural medial roll-over. 3/8 in. or 3/4 in. heel heights broaden footwear choices from dress shoes to work boots. SPS is offering an additional 10% limited-time promotional discount on Orthomerica's® CALIFORNIA™ line of prefabricated spinal orthoses. This limited-time offer is extended to SPS purchase orders through June 30, 2010, and is available exclusively through SPS. New ALPHA® Original MP Liners are on SPS shelves and have the same great attributes, design, and materials you have come to know and love in the ALPHA Original Liner, but at a fabulous new lower price. The new Original MP Liner provides reliable performance for a wide range of amputees as it surrounds the residual limb with skin-friendly, mineral-oil-based gel containing vitamin E.
Available in six of the most popular sizes (small to extra large) to accommodate proximal circumferences of 9-28 in. Cushion (ALC) or locking (ALL) styles available. The Model 1017-A38 Knee Joint, from Becker Orthopedic, is a modular, lever-lock knee joint with a locking mechanism that will automatically engage when the joint reaches full extension. 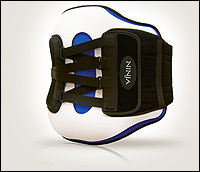 The modular design increases manufacturing options and allows for easier maintenance of the orthosis. 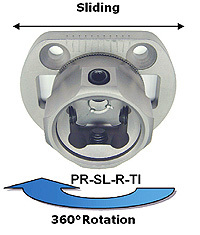 Automatic angled lever-lock knee joint. Heavy duty design-up to 320 lb. 3/8 in. x 3/4 in. (9.5mm x 19.1mm) aluminum uprights. Modular design for use in unilateral or double upright configuration. 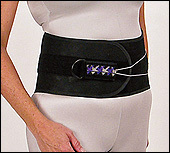 Can be fabricated into orthotic designs including conventional metal and leather, thermoplastics, and composites. 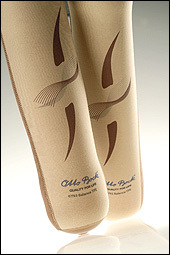 Otto Bock's 6Y93 Balance Copolymer Liner was designed for low to moderate activity level transtibial amputees. The user-friendly, heat-moldable copolymer (TPE) material offers great protection against socket forces for both cushion and locking liners, while encapsulated medical-grade mineral oil keeps skin supple and moisturized. Its unique shape is designed with balance in mind too, with differing wall thicknesses to provide 6mm of cushioning and reduced shear forces where your patients need it-and 3mm of anti-bunching flexibility where they don't. Find out more about how you can get your patients in Balance today. 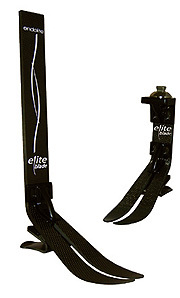 The Elite Blade is a lightweight foot that combines great deflection for running response with a free and easy walking action. If you had to choose only one, this would be it! Sliding and rotating male pyramid adapter. Length guide for ease of setup; LowProfile version is pre-cut to the minimum height. 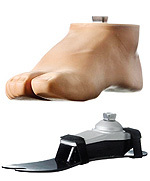 Foot shell, glide sock, proximal pyramid, and fitting clamp included. Having established innovation as its hallmark, SPS is pleased to introduce the latest creation from Touch Bionics™, the Dynamic Flex Covering for the i-LIMB™ hand. The new Dynamic Flex Covering applies high-volume manufacturing techniques to a lifelike silicone pigmentation process, resulting in a lower-cost cover with excellent features and durability. 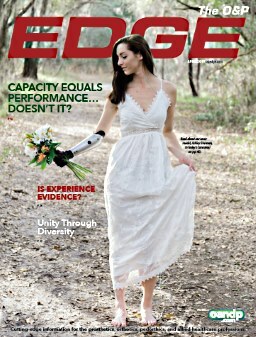 Interior shape designed to optimize the performance of the i-LIMB hand. Ten color options available to match the patient's skin tone. Lifelike silicone pigmentation process provides color accuracy. Reinforced with Kevlar® and Lycra® for longer life and durability. The completely manual operation and positive locking and unlocking design provide uncompromising security and stability for bench pressing, dumbbell flys, dead lifts, pull-downs, and more. The Black Iron Trainer, with a load-rating of 440 lb., also carries a smaller price tag than its larger cousin.